Menton Daily Photo: PhotoMenton et Woof-woof! 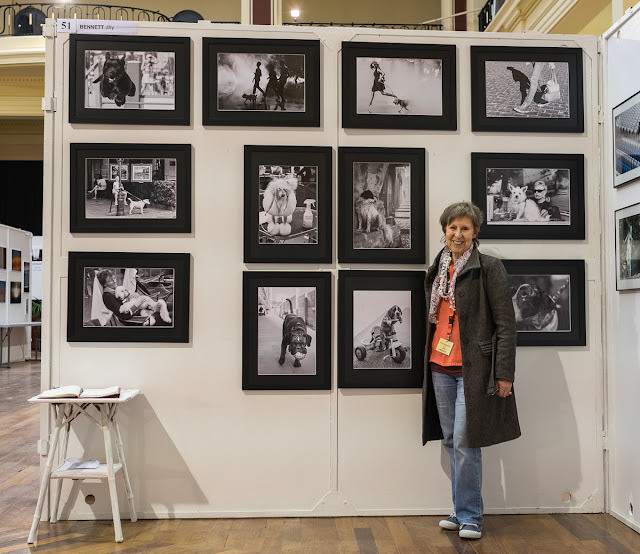 Some of you have kindly asked to see my stand at PhotoMenton this year, so here it is! Woof woof! There are only two more days left to visit the exhibition - 10h to 19h non-stop at the Palais de l'Europe, Menton. 118 photographers, around 1100 photos. I will be there all day on both days - do come and say Hello! Certains d'entre vous ont gentiment demandé à voir mon stand à PhotoMenton cette année, alors le voilà ! Ouah Ouah! Il n'y a plus que deux jours pour visiter l'exposition - 10h à 19h non-stop, samedi/dimanche au Palais de l'Europe, Menton . 118 photographes, environ 1100 photos. Je serai là toute la journée ces deux jours - Venez me dire Bonjour! I wish I could come to see all those wonderful pictures! I cross my fingers for you that you win a price! Thanks for posting a photo of your stand. It's good to see a photo of you too. Jilly, your photos are delightful. I cannot even choose a favorite, although the flying dog and the lady in the mist are top contenders. I wish I was there. As by now you're done, I hope it was a very good run for you! Hard for me to pick a favourite among them. Thanks everyone. PhotoMenton is always the best fun. And so much to learn too - and wonderful chat between photographers. Nice to see YOU too, in front of your great images. Congratulations to you! Very nice work you have created. Jilly did I ever tell you what a beautiful smile you have? You are beaming. Love your stand, as I told you before.